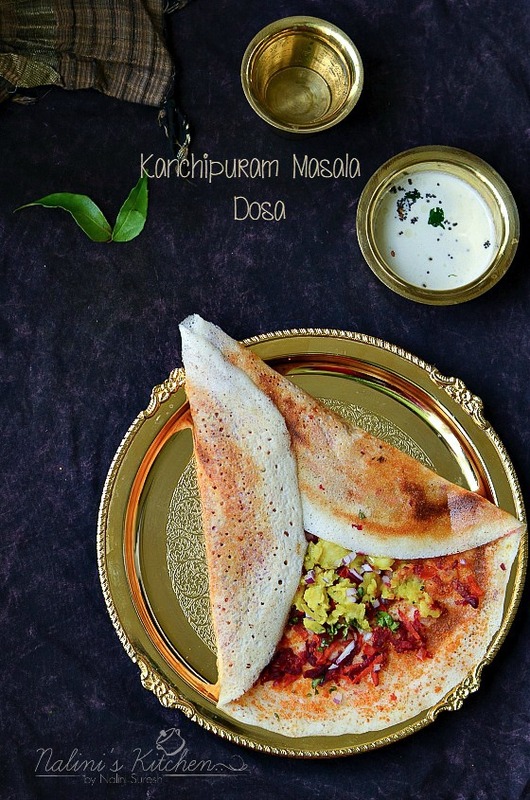 Today's recipe for Cooking Carnival for dosa with stuffing, is Kanchipuram masala dosa.I have shared a version of Kanchipuram Dosa for this carnival for a different theme. 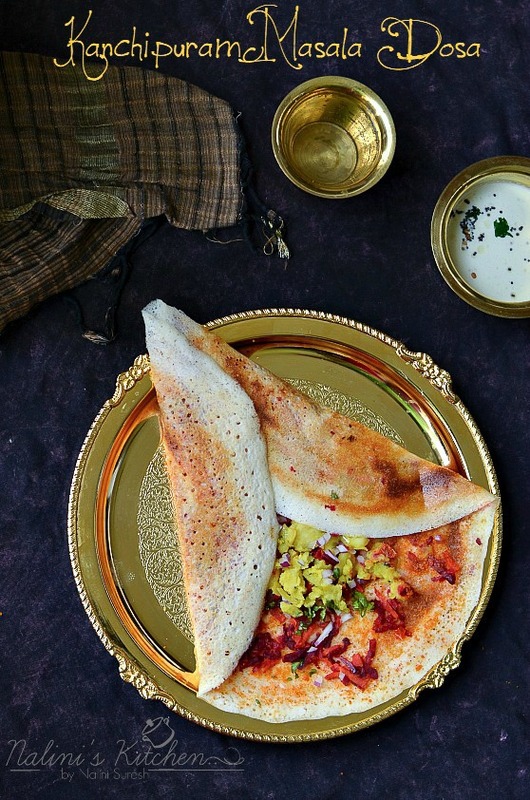 But this dosa is with a colorful stuffing along with potato masala. 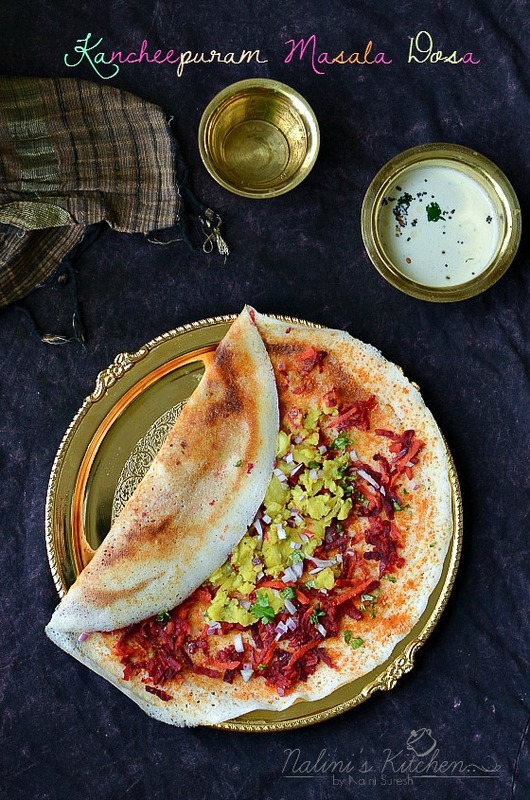 I don't know this dosa exists in restaurants menu,but a friend of mine shared the recipe.The recipe sounds interesting and checked in the internet for reference. Most the recipes are more or less same as the recipe given by my friend.Regular fermented dosa batter is used to make this dosa. 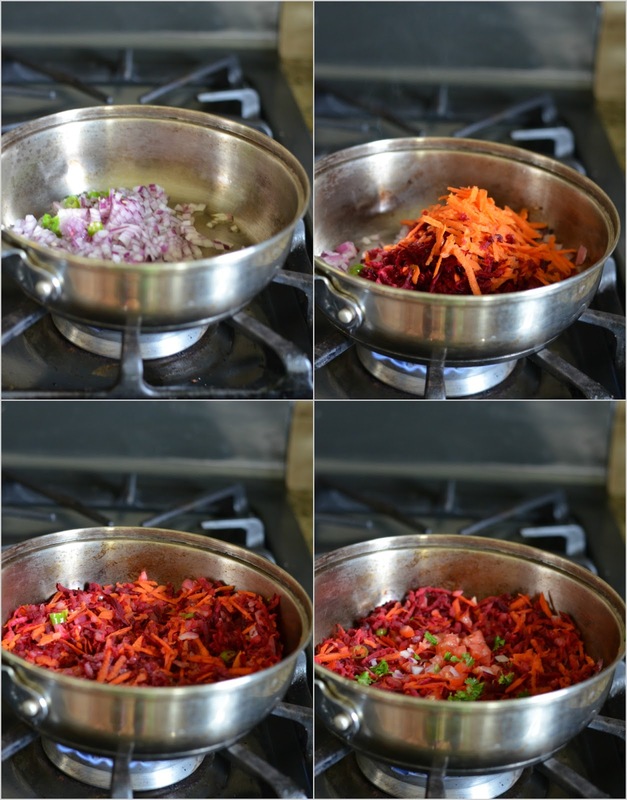 Heat the oil in a pan,add in the onion and chopped green chilly,saute until transparent.Add the grated carrot and beetroot,fry it for couple of minutes. Now add in all the spice powders,salt and give it a mix.Cook it covered for 2-3 minutes in a low flame.Finally add in the chopped coriander leaves and tomato,give it a mix. Put off the flame. 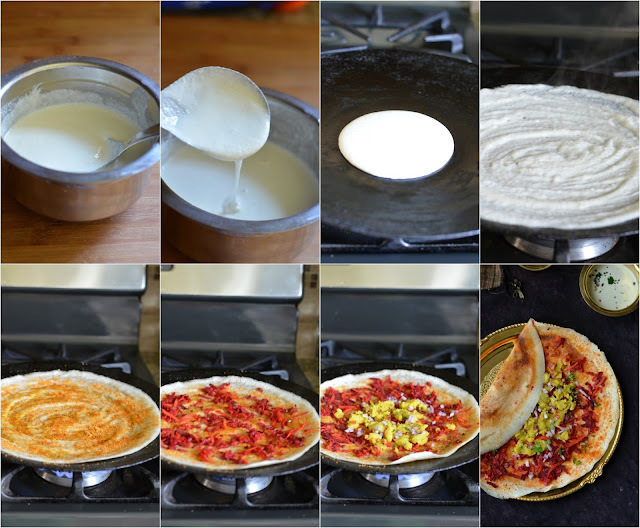 Take the batter and adjust the consistency with water.Heat a griddle and once it becomes hot ,add a drop of oil and wipe it off with a paper and keep the flame in medium.Pour a ladleful of batter and spread it to a circle as thin as possible. Sprinkle 2 tsp of idly podi on top of dosa and drizzle the oil.Let it cook for a minute.Once the dosa gets cooked,top it with the Kanchipuram masala.Gently press it with the spatula.Then keep 2-3 tbs of potato masala on top the dosa.. Spread it evenly on the dosa and sprinkle some chopped onion and coriander leaves.Loosen the edges of the cooked dosa with a spatula and fold it to a triangle.Remove it from the pan. While pouring the batter on the griddle,the flame should in medium.Then only it will be easy to spread as thin as possible. A perfect fermented batter is the key to get a nice golden crispy dosa.Also the addition of fenugreek seeds also. Very very appealing dosa, Nalini. Wow..what a colorful dosa , it is tempting me early morning !the podi, the colorful stuffing , the serve ware , everything rocks !fantastic ! 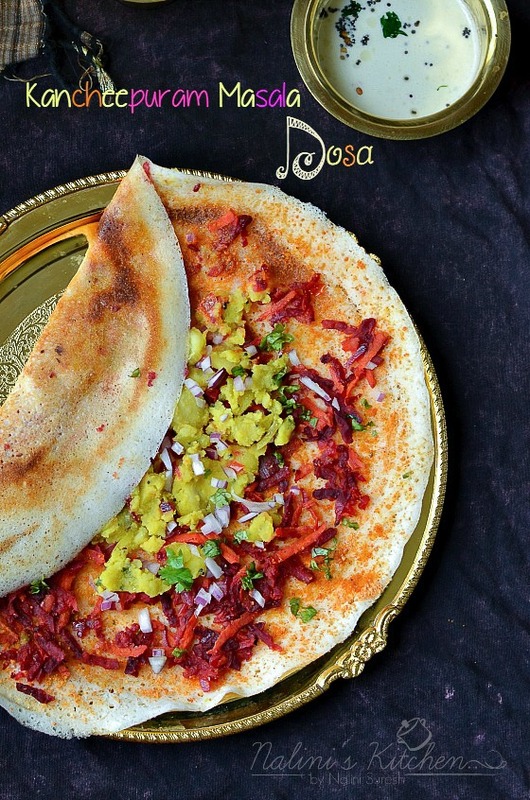 That is an interesting and colorful filling for dosa and lovely setup with those brass serveware. Oh, that knajeevaram masala with carrots and beets look so colourful. And what a spicy masal dosa! It looks so yum..
With all these masala dosa from you, am completely lost and dunno what to pick, you rock simply with this series Nalini. Kancheepuram masala dosa is inviting me. colorful dosa with idly podi, veggies and potato masala. wow. loving you dosa series. Kanchipuram but this is a new recipe ! Nice colourful filling there ! Kanchipuram masala is indeed colorful and perfect for this week's theme. 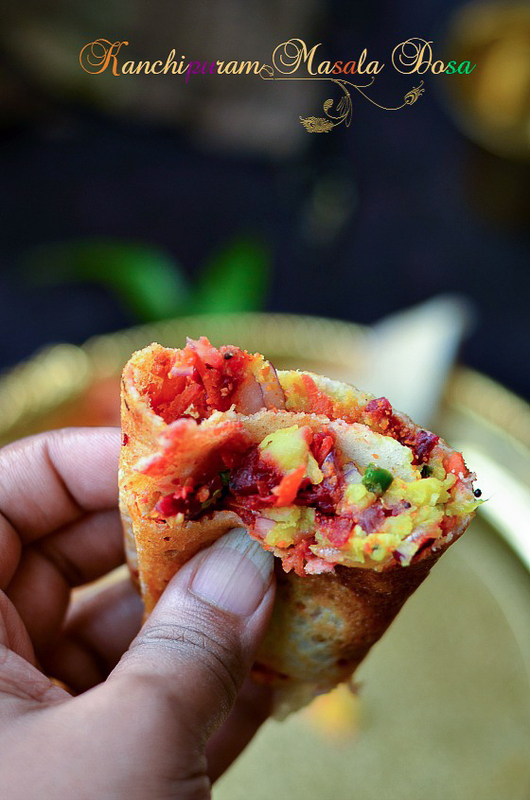 Dosa with beet filling is very interesting and sooooooo colorful. 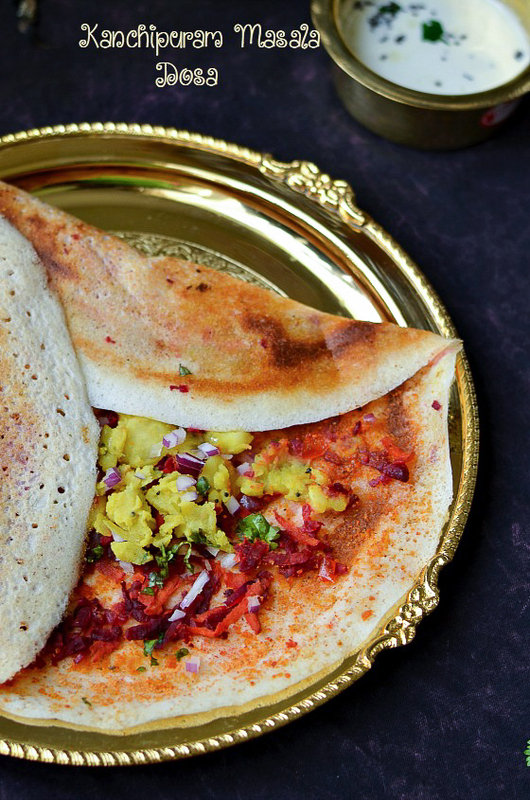 Masala Dosa with beet sounds like a really amazing combination! What a colourful and interesting dosa. From sarees to idlis to doas Kanchipuram has it all. Kanchiuram masala dosa looks out of the world. You are killing me with these amazing dosas. I am so bad in making dosas. I wish I would be living near you to taste such amazing dosas. This is surely such an innovative and new one for me, never heard of it!..the dosa has turned out so good nalini, the clicks and the edits are so amazing!